Fruit salad sounds like very summer dessert, doesn't it? My family always enjoyed it during Ganapati and Diwali festival. And you might be wondering, why? How? Well, we always got at least 5 different fruits for pooja . And when you have so many fruits best way to enjoy them was to make fruit salad! But somehow I rarely made it after coming to US and there was one particular reason behind not making it - chikoos. I love sweet chikoos in my fruit salad, it makes the fruit salad thicken a bit. Last year, I suddenly found bananas, apples, pears, mangoes and oranges in my fruit basket before going on 4 days vacation. And I had to make something and not let them go waste. My mom immediately thought of making fruit salad, and she single made it in the afternoon while I was in office. 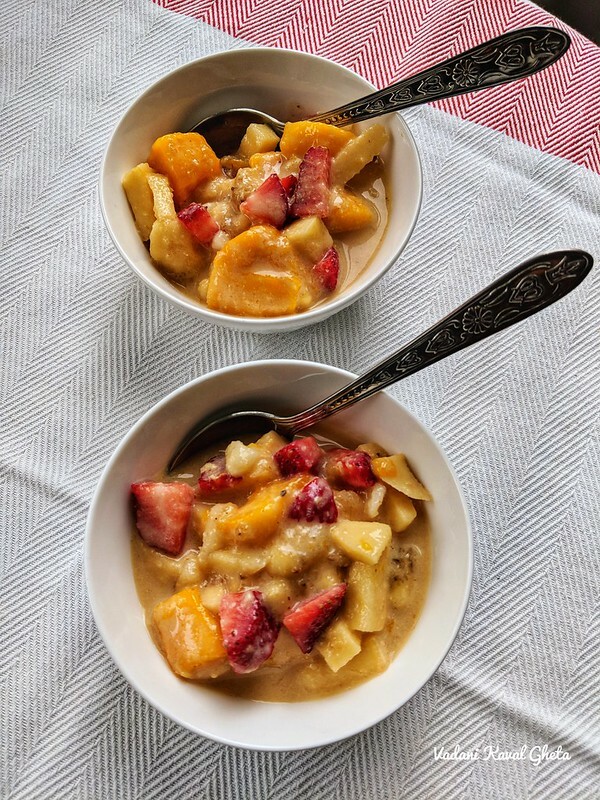 And combination of slightly ripe pears and mangoes together made the fruit salad thicken a little. I have made the fruit salad multiple times after that. Boil milk on stove top at least 15-20 minutes and set aside to cool down completely. You can do this ahead of time and use chilled milk. Peel all fruits except strawberries and grapes, cut all into 1cm dice. Keep adding them to a big mixing bowl. Add sugar, cardamom powder and chilled milk. Add chopped strawberries and grapes on top and refrigerate at least for 2-3 hours. Avoid melons, pineapples in the mix. You can add chopped nuts before serving. Finish within a day or so. Bananas can turn black and might not look appetizing to some, in that case avoid using them.